Ships Monday, April 22 if ordered in the next 1 day, 21 hours and 23 minutes! 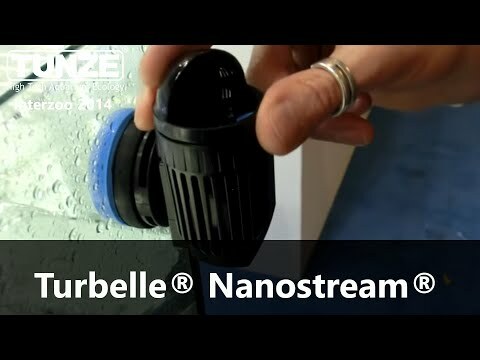 The new Turbelle Nanostream will be available in two different models. The 6020 is the smallest, and it is a non-controllable pump with a flow rate of 2500l/h (660 USgal./h) at just 4watts of power consumption. The other model in this new offering is the 6040, and besides bringing more flow to the table, this model will be controllable and will have a wider deflector. Dubbed the wide flow model, the 6040 has an adjustable flow rate of 200 to 4500l/h (53 to 1190 USgal./h) while consuming no more than 13watts at full bore. The 6040 will be controllable via the Multicontroller 7095, 7096, and 7097 (new model), as well as the Wavecontroller 7092.
where is the power wire attached? will a wire still have to be put inside the tank? Power cord is attached to the pump's body just line on other Tunze powerheads. How much space is needed in front of the powerhead in order to function correctly? I have a 25g cube that has rock all pushed up against the glass in the back but there is still room to put the power head but as the rock rises it leans up against the glas at the top. Would this prevent good water flow? You want to have at least 2-3" of learance between rock and the powerhead for proper water movement. Replaced my Jebao RW15.This power head packs the flow with the odd design. I have this in my 36g Elos. I really like the flow and easy positioning the nano stream anywhere.